Draper, Utah (PR WEB) – September 28, 2012 – Warmzone, a leading provider of radiant heat solutions, has announced that it will be the exclusive distributor of STEP Warmfloor’s advanced roof deicing systems. As one of the largest radiant heat solutions provider, Warmzone offers a vast selection of radiant heat products and services. 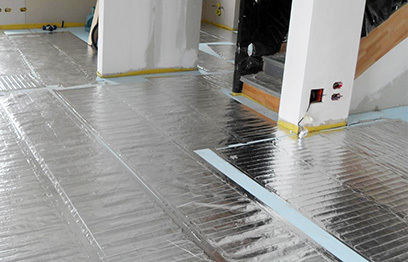 The STEP Warmfloor™ system complements Warmzone’s existing product line and is touted as one of today’s most innovative radiant heating technologies. 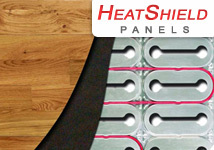 As the manufacturer of one of the most advanced, energy efficient roof heating systems on the market, STEP Warmfloor™ was very selective in determining the ideal distributor for its roof heating product. While Warmzone had already established a track record of successfully selling the system, this was only one aspect involved in the decision making process. Warmzone’s customer service, system design and installation support is second to none, and was a principle factor influencing the outcome of STEP Warmfloor’s choice to appoint Warmzone as the exclusive distributor. Although the STEP roof deicing systems work great, special skills and experience are required to give roofers the confidence necessary to install our system. Warmzone has this knowledge and experience, and have been selling our deicing systems with great success for some time now. Their positive results have led us to appoint them as our distribution agent in the United States for all roof deicing applications, and from this point on, all roof deicing orders will be designed by Warmzone. We feel this arrangement will benefit all parties involved. The STEP deicing system utilizes a unique polymer blend that heats when electricity passes through it. 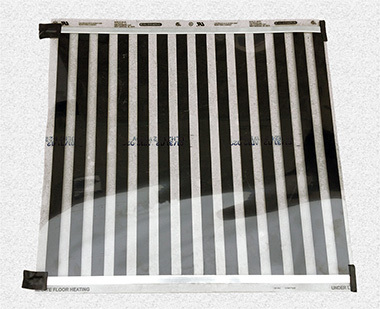 This thin, flexible heating element has the ability to self-regulate its electrical consumption, making it more energy efficient than most other systems. Solar and wind power can also be directly integrated to these heating systems due to its ability to accept AC or DC current. These advanced roof heating products have also been designed to exceed typical low-voltage standards and are now compliant to SELV (safety extra-low voltage) which is 30 volts or less under all load conditions. 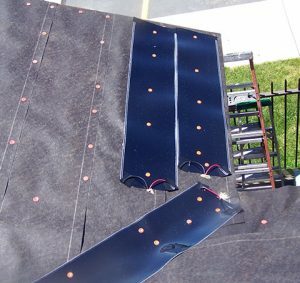 RoofHeat STEP deicing systems are extremely versatile and can be applied beneath all roofing materials, including metal. RoofHeat is an effective and discreet heating system that safely melts ice and snow from eaves to prevent structural damage or safety hazards from falling ice. For a free quote, distributorship opportunities or more information on these roof heating systems or other snow melting and floor heating solutions, contact a Warmzone radiant heating expert at 888.488.9276 or visit www.warmzone.com. 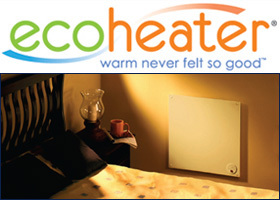 Warmzone’s mission is to match customer’s needs with the finest radiant heating systems available. As an intermediary between project requirements and a variety of system choices, Warmzone offers non-biased, individualized solutions that factor the installation, durability, performance and operational investment as the key criteria of their customers. With a staff of some of the most experienced professionals in the industry Warmzone routinely provides premier radiant heat solutions in both the United States and Canada. Visit us online at Warmzone.com. Salt Lake City, Utah – June 26, 2012 – Warmzone, of Salt Lake City, continues to lead the way in radiant heat solutions. Warmzone’s invitation for membership in the National Association of Custom Home Builders was in recognition for its excellence in the manufacture and installation of radiant heated floors, heated driveways and snow melting systems. Radiant heat is Warmzone’s focus – its only focus – which is why the staff is among the best in the business. When it comes to designing and installing radiant heat systems, Warmzone engineers and designers have over 30 years of collective experience. Perhaps the most revealing indicator behind Warmzone’s leadership and success is its long history of stellar customer satisfaction. Home and business owners alike rave about Warmzone’s services during the design and installation of their radiant heat project. A diverse selection of top quality products and unmatched support services during and after installation are key points that separate Warmzone from its competitors. Salt Lake City, Utah (PR WEB) – March 2, 2012 – Warmzone, a leading provider of radiant heat solutions has announced that it is moving its corporate headquarters from downtown Salt Lake City to a much larger facility in Draper, Utah on March 5, 2012. Located just 18 miles south of the old Warmzone headquarters, the new facility boasts greater office space and increased warehouse capabilities. In addition to Warmzone’s preeminent customer services, the company offers a wide variety of proven radiant heating solutions, ranging from heated driveways and floor heating solutions to roof deicing and portable snow melting systems. This allows Warmzone to offer the ideal solution for the unique needs of each customer. Every project is carefully evaluated and designed prior to any installation. Given the wide product offering and renowned customer services, Warmzone’s growth seems a natural progression. Salt Lake City, Utah, January 3, 2011 – Warmzone, the premier provider of radiant heat products and services, announced the unveiling of its newly designed Website (www.warmzone.com). The revamped site features improved navigation, new product offerings, and a wealth of radiant heat information. The content driven site serves as an information resource for homeowners and construction professionals alike who are considering the installation of a radiant heat system. A comprehensive collection of informative articles and blogs, as well as monthly newsletters and detailed product comparisons are easily accessible through the site’s “Pressroom” and “FAQ” sections. According to Warmzone Executive VP of Systems Design and Engineering, Brandon Weaver, consumers deserve to have as much current information as possible at their fingertips, which is why Warmzone prides itself on providing a comprehensive online radiant heat resource for consumers. As one of the largest providers of complete radiant heat solutions, Warmzone partners with several manufactures to offer the widest selection of radiant heat products at the lowest prices possible. The new website showcases the various floor heating and snow melting systems and identifies the specific characteristics and advantages of each solution. Because Warmzone has cultivated relationships with the industry’s top manufacturers, the website is not limited to a single brand or type of radiant heat solution. Rather, the website serves as a truly informative site that includes accurate information about the most proven, reputable products. Free quotes are also available through Warmzone.com. With a couple of clicks, consumers can submit a form with their specific project details. Warmzone will then evaluate the information and respond with a detailed project estimate, at no cost or obligation. For more information on electric radiant heating, visit: www.warmzone.com or call a Warmzone consultant directly at 888.488.WARM (9276). The Wall Street Journal recently cited Warmzone Sales Manager, Bryan Morris, in an online article, “ The New Cold Warrior,” published January 19, 2011. The piece features an in-depth view of the various snow removal tools and methods that are available to homeowners nowadays; ranging from battery operated snow blowers and ergonomic shovels to fully automated radiant heat systems. The general emphasis of the article is that high-tech snow removal solutions are on the rise because they are not only easy on the driveway and surrounding property, but also on the body. Much of the exposé was devoted to Warmzone, including a spotlight on one of its recent snow melting projects. Richard Silverstein of Chappaqua, N.Y., purchased the snow melting system from Warmzone for his home’s steep 8,000-square-foot stone-paver driveway and walkways around his outdoor hot tub. The 60-year-old neuro-ophthalmologist works out of his house and was concerned that patients and visitors might hurt themselves because of icy conditions. The Journal was particularly interested in the Silverstein job because of the size and scope of the project. Dr. Silverstein emphasized that he didn’t want to be at the mercy of numerous plows and snow blowers, but instead wanted to be “stress free” during the winter months. That’s when he decided to explore the options for radiant heat. Bryan Morris was the Warmzone representative who answered Dr. Silverstein’s call. Together with a team of designers and electrical engineers, Morris worked to develop the extensive snow melting system. As a leader of radiant heat solutions, Warmzone carries a host of industry-leading snow melting and radiant floor heating products. The company also provides professional radiant heat design services along with detailed CAD drawings of each radiant heat system. The Wall Street Journal article further elaborated on the components of Warmzone’s automated snow melting systems in addition to the cost and benefits of electric radiant heating. For a FREE quote, or to learn more about Warmzone heated driveways, roof deicing or radiant heated floors, visit the Warmzone website or call a radiant heat expert today, at 888.488.9276.